Today I Wrote Nothing: Why can't you have two Thanksgiving dinners? HAPPY THANKSGIVING, YOUGUYS! There won't be any cooking here today - I'm saving that for Sunday - but that won't stop us from trying to get fat, anyway. We've got an awesome mini-holiday lined up: first, lunch at beloved Hawksmoor (steak of my heart, marrow of my bones), followed by the Pinner Panto, and then it all wraps up with a Thanksgiving dinner at Capish. The Pinner Panto is a risky one since it's Christmas-themed and I generally try to finish Turkey Day before allowing myself to go mental, but I have a meeting out there so WHAT THE HECK, let's do it. I admittedly have a weakness for London villages, especially during the holiday season. Every little high street gets so frickin' twinkly and charming that everything inside me gets all welly and I start believing in Miracles and Snow and the Innate Goodness of People and it just gets very messy and sentimental for a bit. Speaking of messy, I screwed up another grocery order. 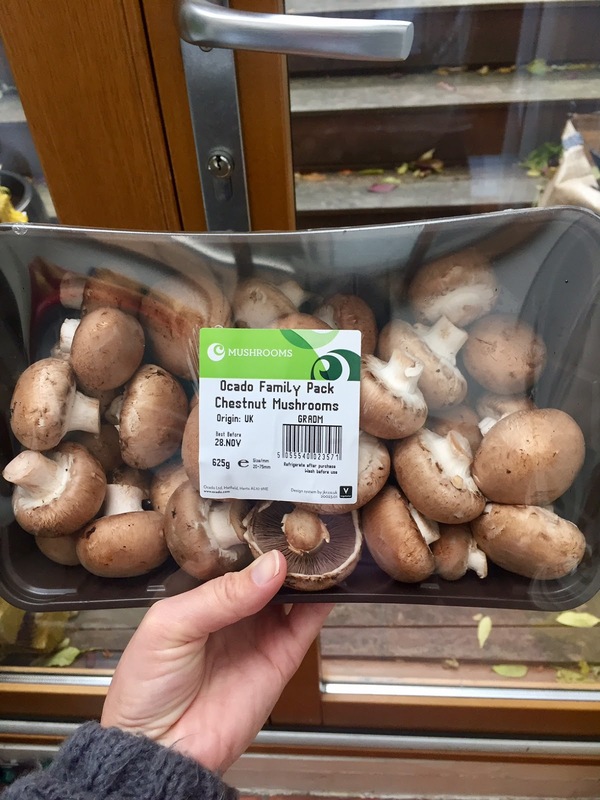 It turns out that 625 grams of mushrooms is A LOT OF MUSHROOMS. I got them for Sunday's green bean casserole but there's enough here to make ten of them so it looks like I'm going to be whacking these into every meal for the next two weeks. Mushroom omelette! Mushroom toasties! Mushroom ice cream! 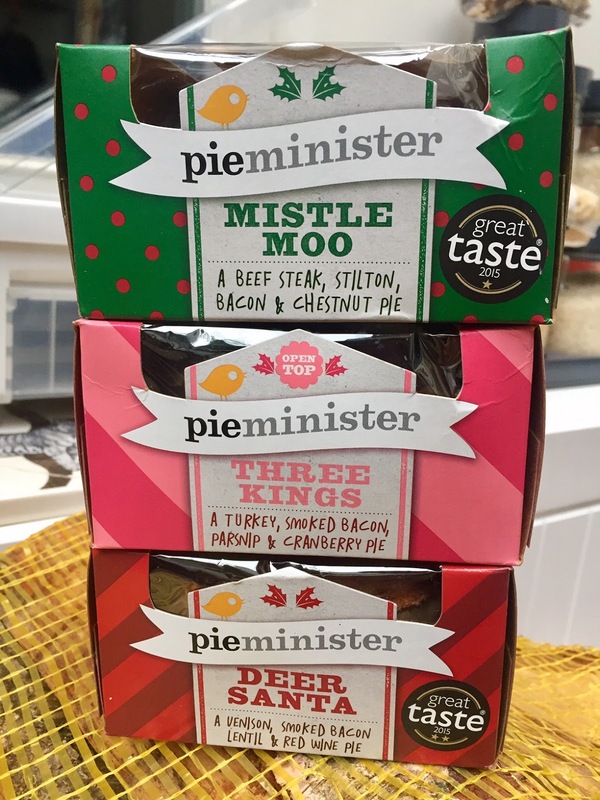 But on the bright side, in continuing my new tradition of Eating Christmas, these beauties from Pieminister have also arrived! 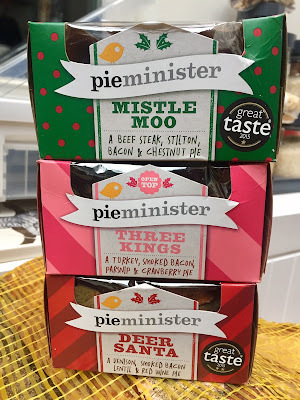 A very exciting recommendation by this foxy lady, these are going STRAIGHT INTO MY PIEHOLE, WHICH IS FINALLY AN EXPRESSION THAT MAKES SENSE. I'll bet they'll taste even better with some mushrooms on top. Before I waddle out, I want to thank you for reading this little blog. I know there's a huge demand on your time and attention these days, so I am thankful for the minutes you spare to come here. I hope you have a wonderful day; my heart to yours. 1. I love that your speaking voice translate soooo well to writing. I get a little dose of Sharona every time I stop by. 2. NO WAY. That sounds crazy(awesome). If you go, you have to tell me how it is! haha! I don't even notice these things when I'm not paid to! Love this. The festivus season of gluttony has begun! I got started a few days ago, just to be on the safe side ;) Happy Thanksgiving buddy!! It's important to practice so our bodies learn how to grow with us. HAPPY THANKSGIVING, DANA!